Ripe, fresh fruit is key to a great-tasting smoothie. Use banana as a base for a thick velvety texture as well as the main source of sweetener in this simple, nutrition-packed recipe. Raw nuts and flaxseed meal are loaded with protein and Omega-3s, and fresh turmeric is a powerful anti-inflammatory and antioxidant. 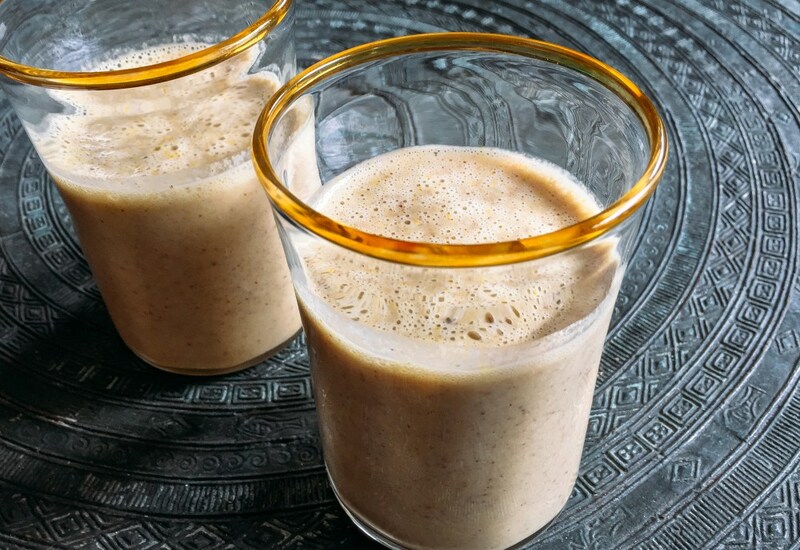 Since coconut water replaces electrolytes and is one of the main ingredients in this recipe, the smoothie is perfect for a refreshing post-workout snack, or a great way to kickstart your day on the right foot. Fresh turmeric is brighter and more vibrant than dried, and you can find it at well-stocked grocery stores or Asian food stores. Try your favorite mix of raw nuts, such as almonds, cashews or hazelnuts. For a more filling smoothie, replace the coconut water with coconut, soy or almond milk. If you don't have super ripe bananas or you'd like to add a little sweetener, try 1/2 teaspoon honey or maple syrup. Per Serving: 241 calories; 14g fat; 25.8g carbohydrates; 7g protein; 0mg cholesterol; 161mg sodium. I drink a smoothie every morning, but never would have thought of this combo. I usually soak nuts for ~10 minutes before blending them into smoothies, so I did that here too. I'd never used turmeric in a smoothie - only in juices - but it blended up perfectly and the taste was great. I used golden milk turmeric for this and a tsp of honey as well. Great way to start my morning. So delicious warmed up!